This verse has so much meaning for me! As a young Christian, I spent a lot of years trusting in the wisdom of man. Even though I was saved, I was unsure of my own ability to understand the word of God, and was wanting to submit to the authority of the preacher in the church we attended....in spite of a still small voice telling me some things were not right. I'm glad to have this opportunity to go back to that time, and be reminded of where I was, and to thank God for bringing our family out of that situation. I think we all need the reminder that this verse gives us, no matter how long we've been saved, because it's so very easy to get lazy about studying the word of God, and just trust what we hear from the pulpit, or from books, devotionals, or even blog posts. So much of what we hear and read is the wisdom of man, and has no foundation in scripture. No matter how eloquent a preacher, no matter how well written a book or article, if it does not point us to the Saviour and him alone, it is merely man's wisdom. Paul states in 1 Corinthians 2:2 For I determined not to know any thing among you, save Jesus Christ, and him crucified. And in 2:4 And my speech and my preaching was not with enticing words of man's wisdom, but in demonstration of the Spirit and of power. 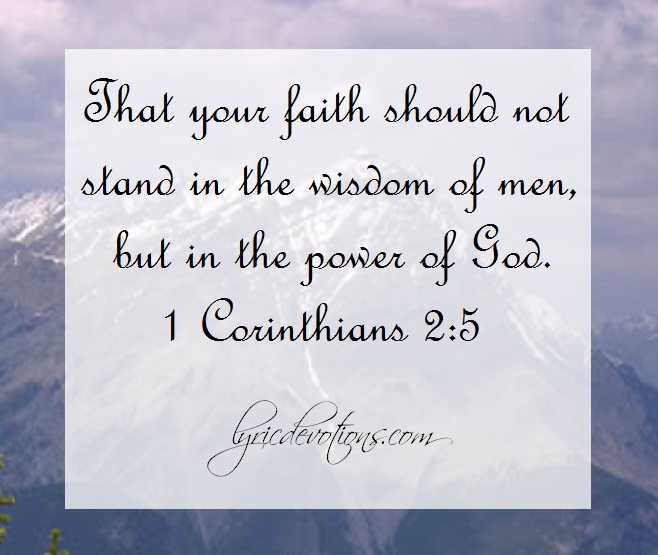 I've talked about this in the past, and have written songs on this topic of trusting in God, not the wisdom of men, so rather than go into it again, I thought I would share a little of what I learned many years ago, after the Lord led us out. An excerpt from No More Wandering In the Wilderness. I was wandering in the wilderness, just outside the promised land. I was following a winding path, carved out by the steps of a man. In despair I cried to Jesus, and he stretched out his hand. He guided me across the barren plain, onto higher ground to stand. No more wandering in the wilderness; that never was God’s plan. No more trips down to Egypt; won’t put my trust in man. I’m discovering abundant life, holding tight to Jesus hand. No more wandering in the wilderness; I’ve left that sinking sand. "I had stopped trusting my own ability to hear the voice of God, and had spent far too much time listening to other voices and following other sheep, rather than heeding the Shepherd’s still small voice. Too often I’d buried my doubts and stuffed my questions, and just went along with the herd. When I finally got my eyes off of men and back on the Lord, he was there to lead me out of the wilderness onto higher ground where I was finally discovering the abundant life that he had for me all along." "It was my own lack of faith that had brought me to this place. 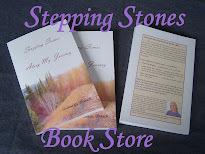 Somewhere along the way I had allowed myself to become content with simply skimming the surface of God’s truth, and as a result I was no longer walking closely to my Lord. When I finally reached out to him and truly sought his face, God’s hand lifted me up to a place where I could once again see the light of his truth. As I felt the healing touch of God’s hand, my doubts and fears melted away, replaced by a wonderful peace in my heart." and beckoned me to seek his face. His truth would set me free. restored the peace and calm. draws me gently to his side. his still small voice my guide. I reached out and took God’s hand. Now on higher ground I stand. Christ did the work on Calvary; secured my place eternally. and not in the wisdom or might of man. but a new creature, in him, I’m alive! "I am so thankful that Jesus did all that was necessary to purchase my salvation at Calvary. Aside from accepting this free gift there is nothing I can do to earn my way into heaven, and nothing I must do to keep myself saved. There is no work of the flesh that will change my destination, or get me inside the doors of the New Jerusalem. When Jesus said, “It is finished,” he had paid it all. There is nothing I can add to the work of Christ. To him all glory and honour are due." Please, join us in the Through the Word link up. Deborah, I love this. We need to let the Still Small Voice speak louder than the teachings of others. We can't go wrong with the words from the Lord. Thank you for sharing with #throughtheword. I love this post. How easy to get our eyes off the Lord and His Word and instead put our trust in man or ideas or thoughts, etc. It reminds me of the verse that says Look to Jesus the author and finisher of your faith. It is He alone on which our faith must stand. Hello Deborah. I am a Pastor from Mumbai, India. 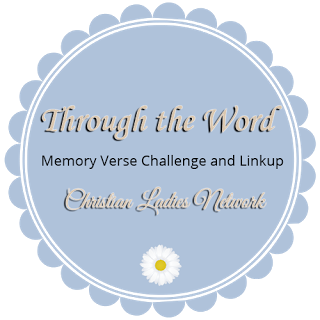 The post The Power of God is very enriching, strengthening and encouraging.I am blessed and feel privileged and honoured to get connected with you as well as know your interest in Christian Ladies net work. I love getting connected with the people of God around the globe to be encouraged, strengthened and praying for one another. I have been in the Pastoral ministry for last 38 yrs in this great city of Mumbai a city with a great contrast where richest of rich and the poorest of poor live. We reachout to the poorest of poor with the love of Christ to bring healing to the brokenhearted. We also encourage young and the adults from the west to come to Mumbai to work with us. We would love to have a group of Christian ladies to come to Mumbai to encourage, strengthening and equipping them for the ministry I am sure they all will have a blessed and rewarding time as well as our women in the churches will have similar experience. Looking forward to hear from you. My email id is: dhwankhede(at)gmail(dot)com and my name is Diwakar Wankhede. God's richest blessings on you, your family and the ministry you do.